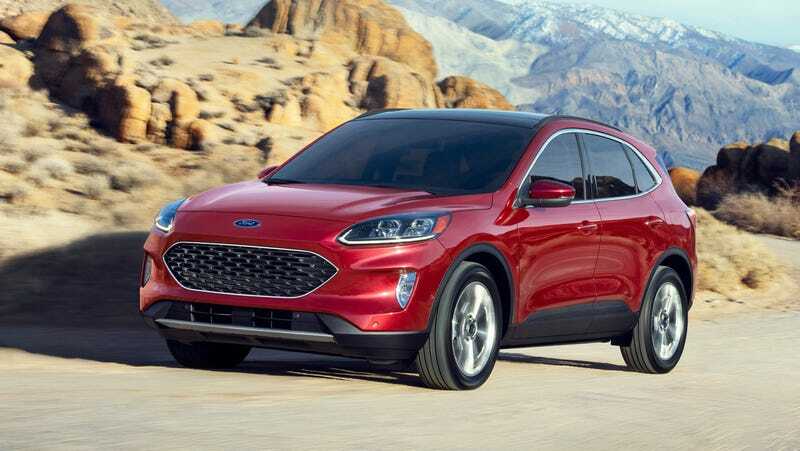 The all-new 2020 Ford Escape is here. It is another small-ish crossover in Ford’s crossover- and SUV-heavy lineup, so no new developments there. Ford is probably also going to sell a bunch of these, so you’d best get used to seeing its vaguely cheerful face everywhere. At least it looks like it’s smiling at you. The new Escape’s biggest selling point appears to be the fact that it comes with four new engine options, which include two all-new hybrids. You can get it with either a 1.5-liter EcoBoost (180 horsepower and with cylinder deactivation), a 2.0-liter EcoBoost (250 horsepower), a 2.5-liter Atkinson cycle hybrid (198 HP) and a plug-in hybrid that will be available on every trim level except the S and SE Sport. Ford didn’t give specifics about this plug-in system, but estimates that it would have a range of “at least 30 miles in electric-only mode” according to the press release. The announcement came alongside the debut of the European-market Ford Kuga today, which is essentially the same vehicle. The new Escape doesn’t look as good as the first-gen Escape from the early 2000s or this new Kuga, but it’s actually not bad. It’s not over-designed and doesn’t have any heinous design choices. The trapezoid grille is apparently inspired by the Mustang and the lower front end, uh, borrows from the Ford GT. Do you see it? Because I don’t. With all said and done, the new Escape loses 200 pounds over the current model because Ford used lightweight steel to build it, and it is lower, wider and longer. Sporty! But it’s also utilitarian: knee clearance and footwell length has been increased for rear passengers with the seats kicked all the way back. But with the rear seats all the way forward, Ford says that the trunk can hold “four sets of golf clubs or a full-size dog crate.” You know, the items that most people own and use regularly. The new Escape also comes with driver-assist tech like park assist and adaptive cruise control. There’s also an eight-inch touch screen, which is standard on all models SE-trim and above. Ford didn’t mention any pricing at this time, but notes that the cars will hit showrooms this fall. The plug-in hybrid models will launch next spring.